David Mackenzie (Sutton-in-Ashfield, Nottinghamshire, 1943) estudou en Oxford e en Nottingham, onde se doutorou coa tese A critical edition with linguistic and historical introduction of the «Corónica de Santa Maria de Iria». Tralo seu paso pola British Library, foi profesor nas Universidades do Ulster (1974-1986), Birmingham (1986-1996) e Cork (1997-2008). Fundador dos centros de estudos galegos nestas dúas últimas, foi asemade colaborador habitual do Hispanic Seminary of Medieval Studies na Universidade de Wisconsin-Madison. Director tamén de diversas teses de mestrado e doutoramento de temática galega, o seu labor de investigación desenvolveuse entre os estudos ibéricos medievais, a lingüística e literatura galegas e a literatura española. O seu mestrado esténdese principalmente entre Europa e Norteamérica, onde desenvolveu o seu labor docente. Foi así mesmo profesor convidado en universidades coma as de California ou Wisconsin, e contribuíu de xeito central e decisivo á creación e expansión dos estudos galegos no mundo académico anglófono e internacional. En memoria de tanto miragre. 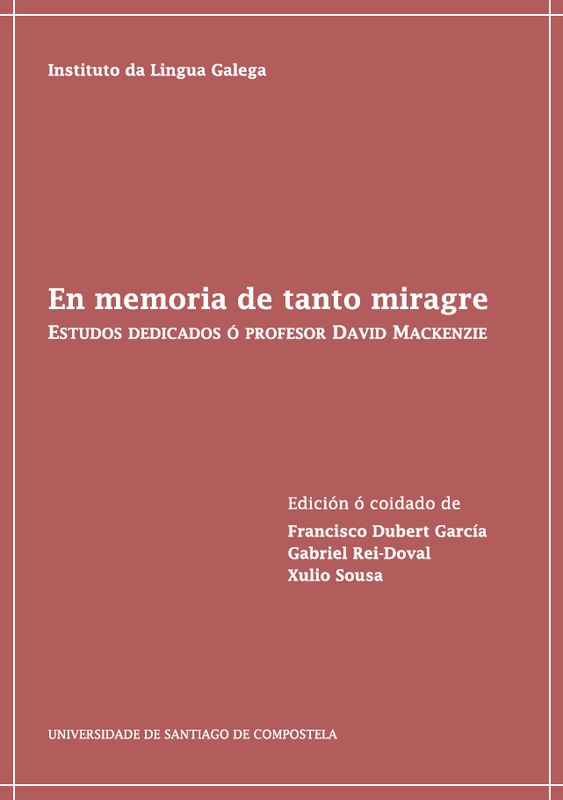 Estudos dedicados ó profesor David Mackenzie é un volume constituído por contribucións realizadas desde diferentes lugares do mundo e relevantes no ámbito da lingüística iberorrománica e tamén para a lingüística e literatura galegas. Estas liñas temáticas constitúen áreas de traballo centrais no historial do homenaxeado. Nesta publicación participan algunhas das voces máis representativas das devanditas áreas, tanto en Galicia coma nos Estados Unidos, Reino Unido, Irlanda e Australia. O Instituto da Lingua Galega da Universidade de Santiago de Compostela comprácese en ofrecer á comunidade científica esta homenaxe, expresión de gratitude e recoñecemento a David Mackenzie, quen sen dúbida contribuíu a abrir tanto Galicia ó mundo coma o mundo a Galicia. David Mackenzie (Sutton-in-Ashfield, Nottinghamshire, 1943) studied at Oxford and Nottingham, where he completed his PhD with the dissertation, “A critical edition with linguistic and historical introduction of the «Corónica de Santa Maria de Iria»”. After his appointment at the British Library, he was a professor at the Universities of Ulster (1974-1986), Birmingham (1986-1996) and Cork (1997-2008). A founder of the Centres for Galician Studies in the latter two institutions, he was also a regular researcher at the Hispanic Seminary of Medieval Studies at the University of Wisconsin-Madison. His research has focused primarily on the fields of Iberian medieval studies, Peninsular Spanish literature, and Galician linguistics and literature, an area in which he has directed MA and PhD theses on an array of topics. His teaching career has extended from Europe to North America, where he was visiting professor at universities in California and Wisconsin. He has been a central and important figure in the expansion of Galician Studies internationally, most notably in English-speaking academia. En memoria de tanto miragre. Estudos dedicados ó profesor David Mackenzie is a volume comprising contributions from scholars from around the world. The articles range in subject matter from studies on Ibero-Romance linguistics to Galician linguistics and literature, areas of study central to the honoree’s research interests. The contributors to this volume, from Galicia, Ireland, the United Kingdom, the United States and Australia, are among the most recognised experts in these fields of study. The Instituto da Lingua Galega at the University of Santiago de Compostela is pleased to offer this homage to the scientific community as an expression of gratitude and recognition to David Mackenzie, whose efforts have helped not only to open up Galicia to the world but also the world to Galicia.